Summer’s not over yet! There is still plenty of time to enjoy all the sunshine, outdoor activities, and fresh produce before the cooler weather comes to stay. 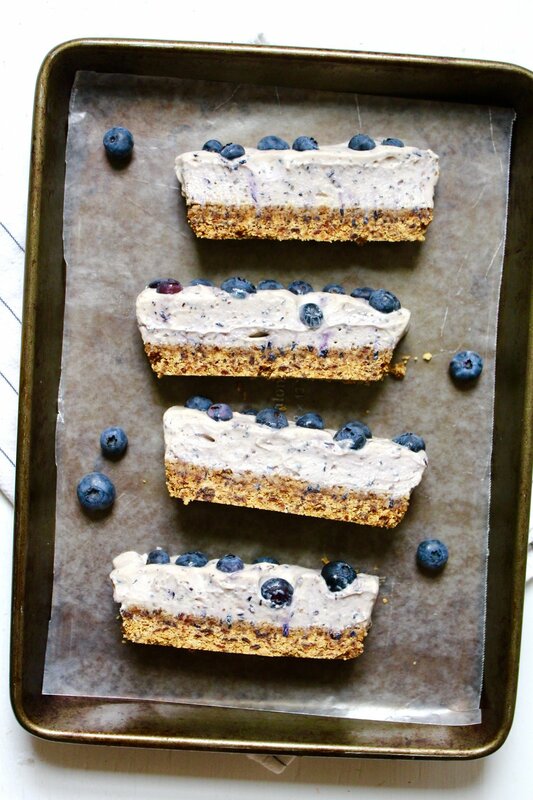 These blueberry cheesecake bars are a wonderful way to celebrate the not-end of the season. Traditional cheesecake is amazing (obviously), but super high in fat and sugar (which is why it tastes so amazing). This makes it hard to enjoy it more frequently within a health and performance conscious diet. So, I set out to create a version that was at least a little lower fat, and definitely lower in sugar. This one is both, as well as still having that awesome cheesecake flavor. These bars are decadent, rich, creamy, and sweet. They have lovely complimentary summery blueberry and lemon flavors. The crust is chewy and dense, yet still a bit crumbly like a regular cheesecake. It all comes together to make a really delicious dessert that hardly makes you miss the real/old thing. Plus, there is no baking involved! Yay! It’s hot enough outside, no need to heat up your house or put in that extra work. I hope you enjoy these bars and take advantage of the still-summer season out there. The cold, cold winter will be here soon enough. 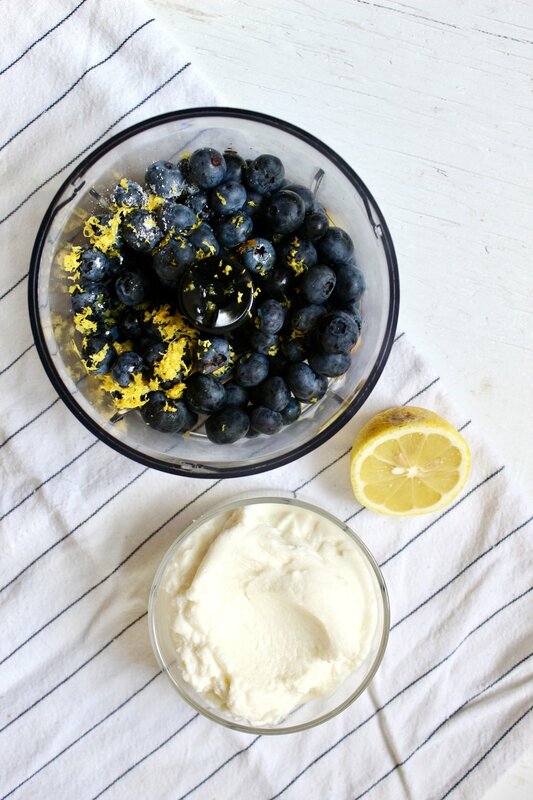 So, grab the blueberries and let’s get celebrating! Break up graham crackers into chunks. Blend until sandy in a food processor, then remove to a bowl. Place dates in food processor and blend until mostly broken down into small pieces. Add the butter and salt. Pulse and blend, pushing down with a spatula as needed, until fully incorporated. 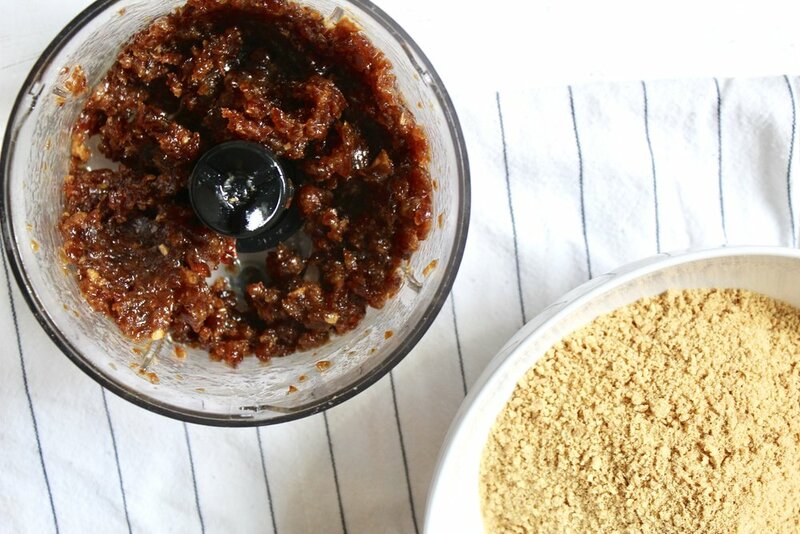 In batches, blend in the graham cracker crumbs. Process until it all comes together homogenously. Line a loaf pan with plastic wrap. Use a piece that goes well over the sides, as the extra will be needed. Pour the crumbly mixture into the loaf pan. Press down firmly and evenly to create the crust. Fold over the plastic wrap to cover the surface and place in the fridge. Wash out the food processor. Then add in 1 cup of the blueberries, sugar, lemon juice and zest, vanilla, and salt. Blend until smooth, and then whip in the ricotta until smooth again. In a big bowl, whisk the cream cheese to break it up. Whisk in the blueberry mixture until it all comes together completely. 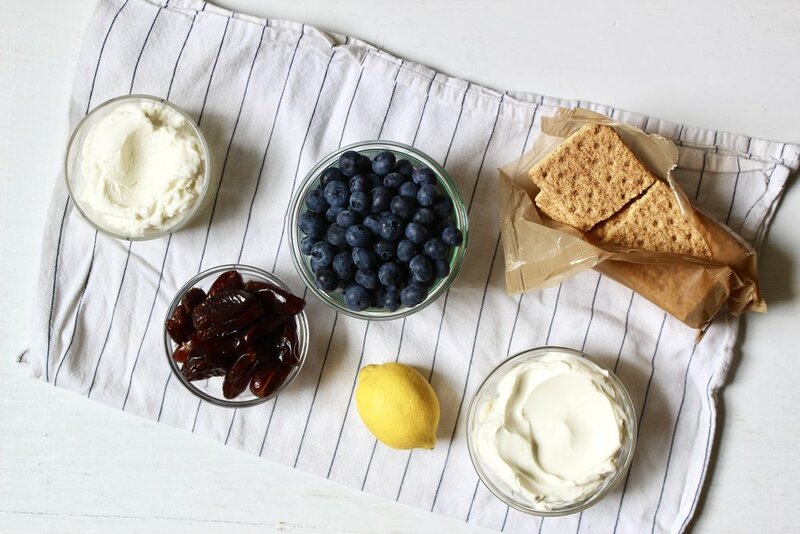 Remove crust from the fridge, peel back the plastic wrap, and pour on blueberry topping. Even out with a spoon or spatula and top with the remaining 1 cup blueberries. Press berries gently into the top. Cover with the plastic wrap and chill through in the fridge. This will take a few hours, but leaving it overnight to chill is ideal I think. When ready to eat, remove from the loaf pan onto a cutting board. Peel off the plastic wrap completely. Then just slice into ~8 bar servings. You could definitely make more or less servings as you like. Extras will keep a few days in the fridge, but the crust may begin to get a little soggy. Notes: Use any flavor of graham cracker you like. There are some pretty cool ones out there now, I used vanilla here. If you use deglet noor dates, which aren’t quite as sticky as medjool, you may have to use a couple more to reach the same consistency. If using frozen blueberries, thaw before blending.